This is probably the first review I’ve done. 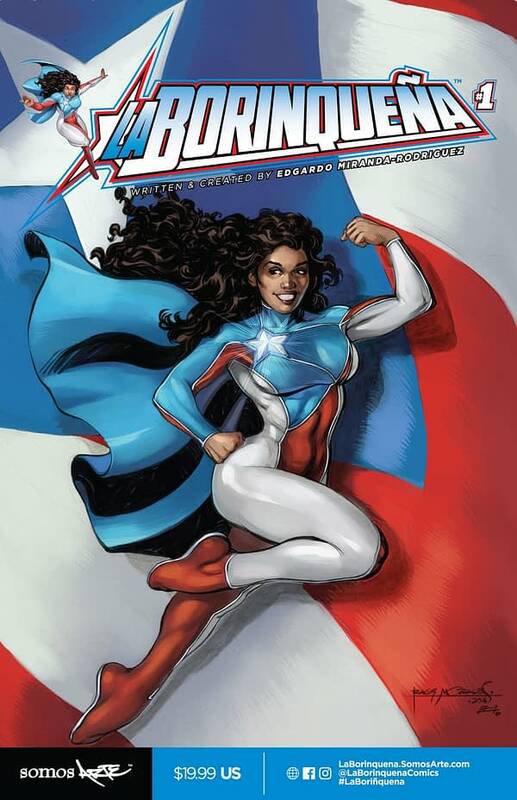 Well, I technically did a very small review for another La Borinquena story when I interviewed Edgardo Miranda-Rodriguez the writer/creator of the superhero comic book. It’s typically not something I like to do but I thought I would give it another shot and check out issue one of La Borinquena which drops December 22nd. Now this issue of La Borinquena is almost a triple-sized issue. 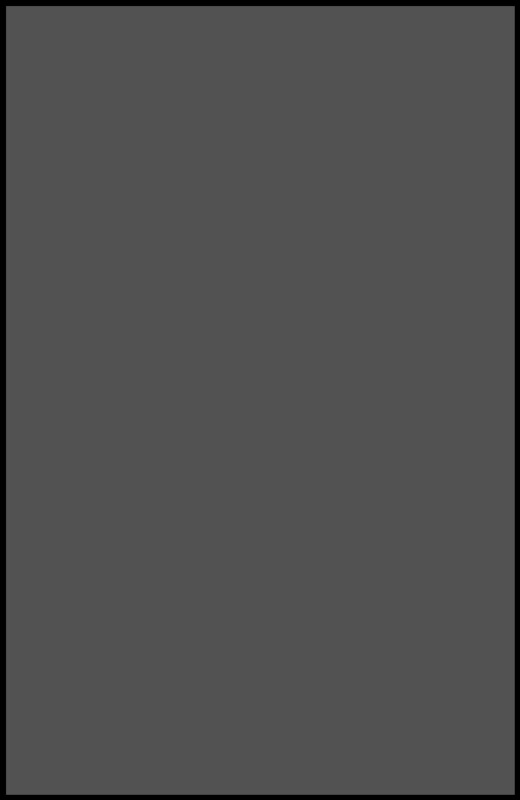 Most comics are about 20-22 pages each (of actual story) and this one comes in at a whopping 61 pages (based on the PDF page count) but minus the covers, some pinups, and an ad or two and the story you get is a bit over a double sized issue or in this case what amounts to a prestige format graphic novel. Which is not bad when you consider that you’re getting two stories. So, let me first start off by saying I like the comic. Now it’s not perfect but I think the team Edgardo has put together here have done a great job and they’re all Puerto Rican. Heck, even the print shop used is Puerto Rican. Which to me is fascinating in and of itself. I’ve only ever read one other comic book with an all Puerto Rican team and that was Dave Alvarez’s comic Changuy. Overall, none of this will probably matter to those reading this review but for me, it filled me with a sense of pride (as cheesy as that sounds) and it made me feel happy to see my people come together to add to the long-running history of superhero comic books. Now for those wondering what this book is about. Here is some info on the comic and the people behind it straight from the website. 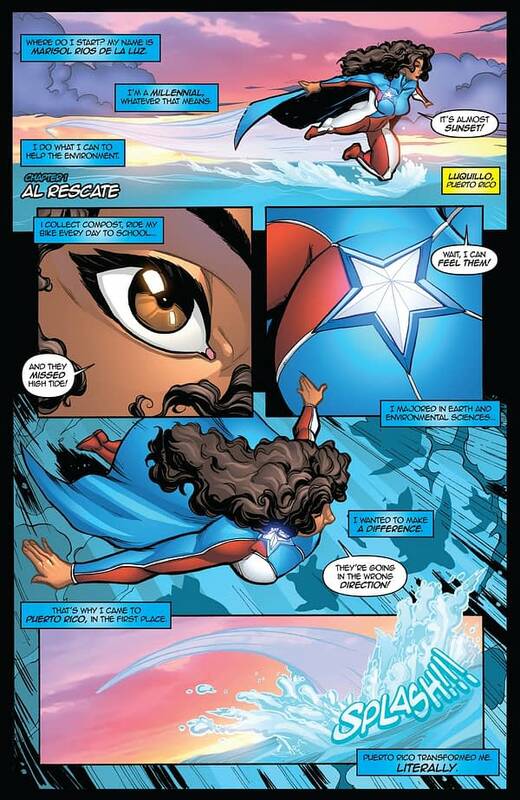 La Borinqueña is an original character and patriotic symbol presented in a classic superhero story created and written by graphic novelist Edgardo Miranda-Rodriguez. Her powers are drawn from history and mysticism found on the island of Puerto Rico. The fictional character, Marisol Rios De La Luz, is a Columbia University Earth and Environmental Sciences Undergraduate student living with her parents in Williamsburg, Brooklyn. She takes a semester of study abroad in collaboration with the University of Puerto Rico. There she explores the caves of Puerto Rico and finds five similar sized crystals. Atabex, the Taino mother goddess, appears before Marisol once the crystals are united and summons her sons Yúcahu, the spirit of the seas and mountains and Juracan, the spirit of the hurricanes. They give Marisol superhuman strength, the power of flight, and control of the storms. Written, lettered and art directed by Edgardo Miranda-Rodriguez, edited by Matthew Barbot, illustrated by Emilio Lopez, Will Rosado, Eric Jimenez and introducing Sabrina Cintron with digitally coloring by Juan Fernandez. Cover artwork by Ralph Anthony “Rags” Morales and Emilio Lopez and a variant cover art directed by Edgardo Miranda-Rodriguez featuring art by a who’s who of Puerto Rican comic book professionals featuring the talents of Chris Batista, Chris Sotomayor, Emilio Lopez, Eric Jimenez, Felix Serrano, Gustavo Vazquez, Juan Fernandez, Ralph Anthony ‘Rags’ Morales, and Will Rosado. As for my review. Here we go. The book starts off in the present with Marisol Rios De La Luz out over the waters of Luquillo as her alter ego La Borinquena. When suddenly she realizes that a gathering of sea turtles has missed the high tide and are heading the wrong way. 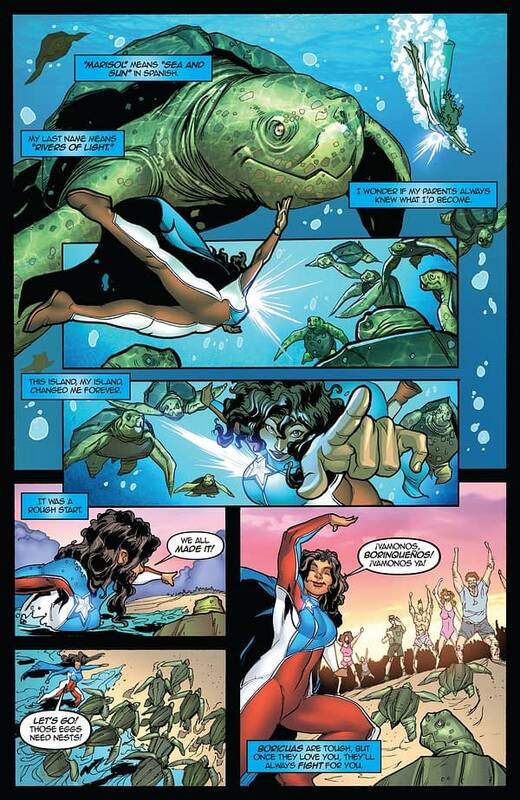 So being a child of Puerto Rico and bestowed (with great power) by the mother goddess (more on that later) she decides to help the turtles get to where they need to be. And in getting them to land so that they can build the nests for their eggs she wins the accolades of her people in a celebration that wouldn’t be out of place in a Superman comic but in a way, that only Boricuas can. But that’s not before more danger rears its ugly head this time in a scene that’s reminiscent of the airplane rescue scene in Superman Returns and the Supergirl TV show. Even Marisol herself points out the similarity to the scene in Supergirl before realizing real world physics don’t exactly work the same way they do in television. What this opening does in seven pages is set up who La Borinquena is. What she can do and the type of person and hero she is. As for how she got to where she is today. Well, that begins on the next page when we flashback to her life in Brooklyn New York and what lead her to Puerto Rico. I’m not going to go into a beat per beat breakdown. Especially given that the above summary from the site does a concise job of summing things up. But I will say the comic does a good job of establishing her life as a college student, her family (in New York and on the island), her best friend Lauren ‘La La’ Liu and a natural reason for her going to Puerto Rico. Something that makes sense for her character and adds to her story. Another thing I enjoyed is how she gained her powers. To me, it’s very reminiscent of DC comics Shazam but utilizing Puerto Rican mythology. Her powers are given to her by Atabex or as Marisol refers to her the mother goddess and Huracan the spirit of the storms and Yucahu the spirit of the sea and mountains. All of that together gives her strength, speed, flight, the ability to control the winds, swim in the oceans like the sea life and communicate with those down below. She’s kind of a mash-up of the X-Men’s Storm, Superman, Shazam, and Aquaman, but without feeling like a cookie cutter Frankenstein copycat creation. 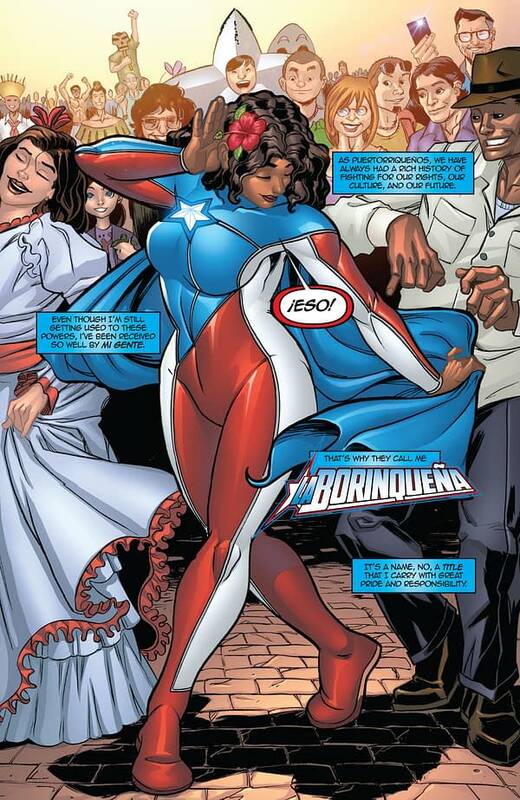 Even the reason for her costume and why it’s reminiscent of the Puerto Rican flag is unique. Before Marisol leaves to Puerto Rico gives her mother gives her a ribbon that’s been in the family for generations that is made from the leftover fabric that was used to embroider the Revolutionary Flag of Lares. 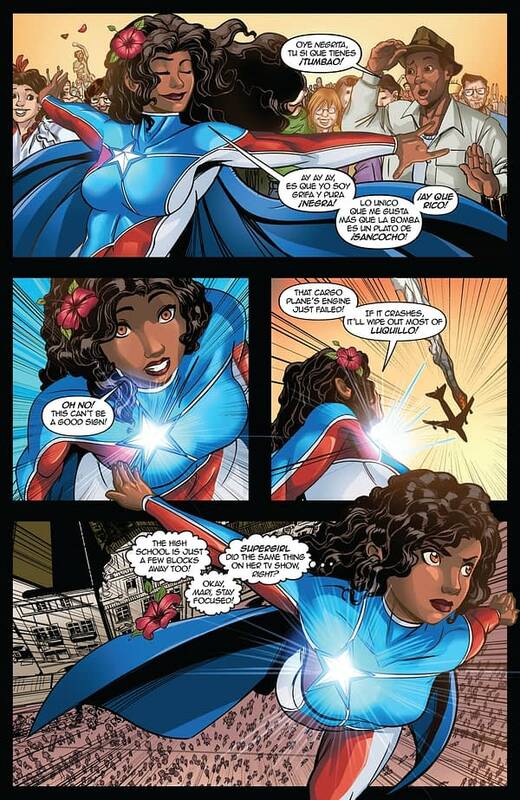 So, when she’s communicating with the mother goddess is uses that ribbon to create La Borinquena’s costume. It’s these nice little touches that make the character and comic. Including how she gets her name. It’s given to her by the people while she’s out rescuing them during this horrible storm. One of the things I also liked about this comic and being a fan of Captain Planet and the Planeteers are the touches of environmentalism. Considering how we could surely use another Captain Planet type show I nominate this comic. Now I’m going to talk about one more positive before I go onto the negative. The art is fantastic. There are three different artists throughout the comic and each one highlights and balances different scenes perfectly. The pencils, inks, and colors all work and nothing really conflicts. The coloring or inking style that’s used for one set of penciled sequential pages isn’t carried over into the other which has a vastly different and more realistic style. It’s a team that knows what it’s doing and when one style works for one part of the story and when another is more appropriate. Generally, more than one artist on a single story sometimes doesn’t work. It can create a conflict that pulls you out of the story with the clashes of style but here it works as each style matches the current tone of where the story is going at the time. Now onto the negative. So, there are scenes in this comic in which Spanish is spoken and in some of those you really don’t need to know what they’re saying as the art pretty much conveys what’s going on and what’s being said tends to be nothing special. Generally, in comics they use brackets for foreign languages and in those brackets the dialogue is in English but there will be a caption saying translated from and the language. Not here. Which is a bit odd but not unusual and I’ve seen it before in other comics and more so in movies now a day where they don’t translate certain dialogue scenes. However, anything that’s vital to the story or a character does get translated. And I feel that when Marisol is saving the people during the storm and how she gets her name should have been done using the brackets and in English. Because it’s important to her character and now those who don’t speak Spanish won’t have any idea what’s going on in those scenes. Obviously, she is saving people but so much more is happening. It’s her coming into her own as a hero and the people are being given hope and in turn, they name her and all that gets lost if only myself and other Spanish speakers can understand what’s going on there. Now it’s not all Spanish. In this scene, it goes back and forth between Spanish and English with Marisol doing the English speaking but still you’re robbing a section of your audience of a moment. Another thing I didn’t like is that the main story has no enemy. It’s a classic superhero but with no villain or enemy of any sorts. The story here is more set up than anything else and that’s fine but a confrontation with someone else besides herself and nature would have been nice. 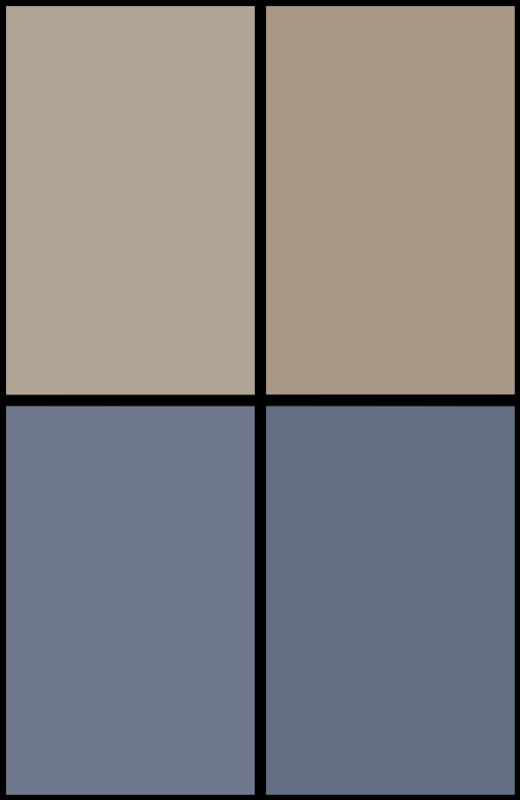 There are two pages towards the end after a series of pinups that allude to potential enemies. Especially one that might be of supernatural origins like herself. And that’s all and good to get your audience to come back but a little superhero/supervillain confrontation would have been nice. Or any villain at all. It didn’t need to be a supervillain. There’s also a character (and plot element) brought in that you think is going to be an issue and someone Marisol must overcome later or who will get in her way but nothing ever comes of that and they just end up becoming friends after what amounts to a dance showdown. Honestly, you could remove that character and situation and it wouldn’t have affected the story at all. I still have no idea why she was mad at Marisol other than to illustrate how some island-born Puerto Ricans are jerks and uppity when it comes to Nuyorican’s. Besides those negatives aside I still enjoyed this book. It touches on a lot of things I love about the superhero genre while also doing it in a way that comes of original by its use of Puerto Rican history and culture. So, if you love Shazam, Superman and Supergirl and Captain Planet then give this comic a shot. Plus from what I was told George Perez will be doing the cover to the second printing and the original art will be auctioned for charity. As for what I would score this comic. I give it 3 and ½ out of 5 Puerto Rican flags. Marco Lopez is the co-owner of the website Atomic Rex Entertainment. Where you can find the ongoing weekly webcomic Massively Effective, that Marco describes as Bill and Ted in tights. Also hosted on the site is Marco’s web strip series Orion’s Belt that follows a family of adventurers in space and his anthology series A Shot of Whiskey. Marco has also written for Zenescope Entertainment and Lion Forge Comics. Marvel Comics’ Involvement With The Inauguration Of President Trump?